Today’s fragmented media landscape and information-loaded digital world offers brands new opportunities to communicate directly with their audiences; building visibility, affinity and even search traction along the way. However, success in the uppermost reaches of the funnel requires organizations to put corporate agenda in the back seat, and instead adopt a more journalistic approach to crafting and publishing their stories. Not to be confused with content marketing, brand journalism is an upper funnel tactics that delivers more than ‘awareness.” Telling the brand’s stories in a compelling, audience-focused way can create affinity, earn media, build brand credibility and (when coupled with search and social strategies) deliver long-lasting online visibility. There are distinct and important differences between brand journalism and content marketing, and they’re best expressed not in terms of content output but in terms of intended outcomes. I think we all agree that content marketing and brand journalism both have deliver information that is useful and interesting to audiences. 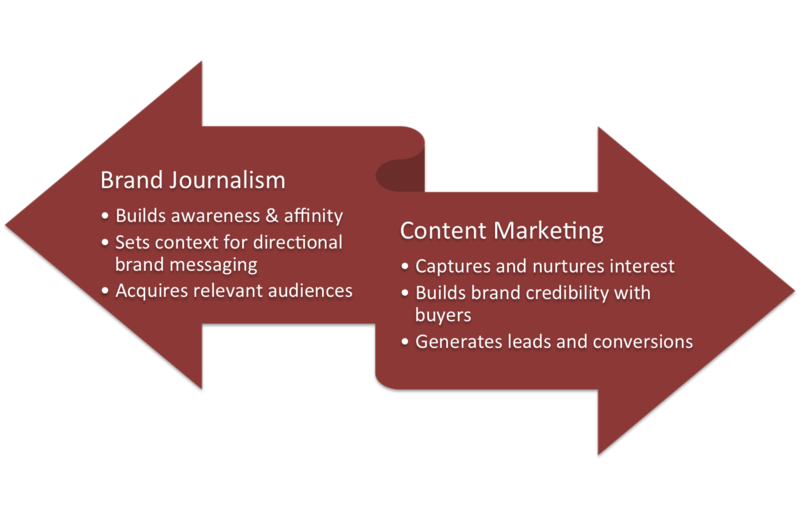 So let’s look at the intended goals of brand journalism and content marketing, respectively. I’ll take a stab, and I welcome anyone else’s additions. Starbucks’ newsroom is loaded with brand stories that masterfully create affinity and position the brand. Brand journalism goal: Finding and telling brand stories in order to convey a comprehensive image of the brand and build brand awareness and affinity. Case in point: The story on the Starbucks newsroom about the art on a holiday mug is an example of telling the story of an employee’s journey within the company. Is this story selling coffee? No. It’s conveying specific information about the brand image. I wouldn’t call this content marketing. To me, this is brand journalism. Content marketing goal: Influence audience behavior by publishing useful content that supports the customer journey, encourages loyalty and enables amplifications. Brand journalism couples the brand perspective with a journalistic approach, telling stories to create utility for the audience and context for the brand. Many stories published within brand journalism programs make no reference to the brand doing the publishing. Nonetheless, the brand’s expertise is on display when a story provides an insider’s look at an industry that a legitimate media outlet could have produced. Content needs to be designed and deployed with deliberate and measurable goals in mind. If Starbucks was publishing a bunch of employee stories and expecting to see a corresponding lift in store traffic, they would probably be disappointed – and the content budget might suffer in the future as a result. Content marketing and brand journalism are not mutually exclusive. They can (and should!) exist together – and furthermore, they should be aligned, in order to position the brand and acquire audience likely to value (and act upon) the other content the brand publishes. Integration of brand content across multiple communications channels is a crucial component of driving content discovery. The intended outcomes underscore the important difference between brand journalism and content marketing, and their relationships to the company’s overall strategy – are details marketing teams need to pay attention to. Failing to do so can stymie a brand’s content programs, rendering them un-measurable. We know that measurement and gauging ROI continues to be a challenge for content marketers. I believe that a primary cause of measurement-related problems stems from content that is published with no clear goal in mind. The most profound benefit brands derive from a strong and focused brand journalism strategy is the development of a relevant and engaged audience. Twenty years ago, the only way to reach broad audiences was through advertising or a mention in a news story. Today, brands communicate directly with their core constituents, and the audiences they build become important assets. Additionally, branded content creates important context for more targeted and actionable brand messages, developing affinity very early in the buyers’ journey. Internal communications:Stories provide a big picture that data doesn’t, lending important context to brand messaging. Additionally, stories are memorable. Taken together, these two factors help employees more fully understand and participate in the company’s strategy. Sales enablement: Brand storytelling can also be an important sales and customer service training tool, delivering memorable content that is ideally packaged for relay to customers and prospects. Media relations:PR pros who believe that media won’t cover a story that the company develops are missing the point, Ragan noted. Story-driven pitches can help journalists grasp nuance and see different potential story angles. Bonus: Artful keyword use can generate valuable implied links that bolster search results when the stories run on key media sites. Storytelling is the flavor of the day in marketing circles, for several reasons. As mentioned previously, stories are sticky. They linger in memories and influence behavior. Brand stories also help put human faces on company messages, increasing likability and brand affinity. These factors can trigger additional amplification, as people tend to share content they like with their social networks. 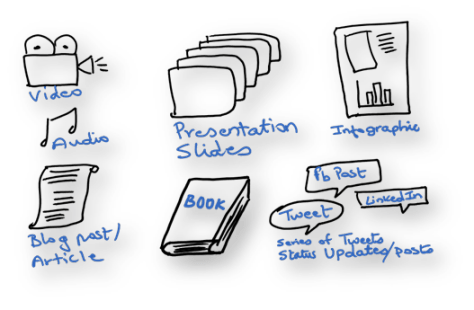 Taking the time to build the brand journalism practice within an organization’s communications teams is no small effort, however, the benefits to the enterprise in terms of lead flow, audience building and search visibility more than offset the investment.